I sat hunched in my chair at my computer, going over my Accounts Receivable. Sometimes I will offer clients a billing system based on regular monthly payments. Most of the time it works out well, but other times, people just don’t pay as they had promised. On this particular morning, I reviewed two accounts that were more than a year old. Now it was time either to write a strong demand letter with a threat of legal action or to turn the accounts over to a collection agency. But as I sat there neither choice felt good to me. Quite the opposite: I felt depressed, uncomfortable, and irritable. I thought about what action would make me feel good and it came to me clearly: Send these people a nice note wishing them the best and letting them know I was writing off their balance. With that thought, a smile danced across my face and I wrote off $1,195. It was a joyful choice that I felt happy about. The next day, my accountant called to tell me that I was due a tax refund. That evening, I went out to play poker. Poker is a fun and relaxing hobby of mine. Believe me, I am not a high stakes player! This particular evening I was having a rather lucky run of cards, what poker players call “being on a rush.” I was up about $100 when I hit an unbelievable “rush.” I got four of a kind, a straight flush, all the great hands. The cards all just lined up the way I wanted them and I won and won and won. I left the poker table with more money than I had ever won before at one sitting: $1,115! Sunday morning, as I drove to my Easter family gathering for church and brunch, I wondered why I had been so lucky this particular weekend. 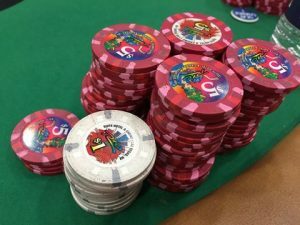 Between the tax refund and poker, I had received $2,773 in “Magic Money”—unexpected income. A chill ran down my spine as I suddenly realized it was a complete demonstration of the principle of “Give, and it will be given to you.” By releasing others of their debt to me, I had opened the floodgates of my own prosperity. I sang The Hallelujah Chorus that morning with extra feeling! Is there a debt you could forgive today? Here’s a tip I have for everyone: in the poker game of life there is winning and losing. Sometimes you’re going to do all the right things, play perfectly and still lose. Sometimes you’re going to do all the wrong things, make terrible mistakes, and still win. Learn to accept them both, like a surfer who catches wave upon wave for brilliant moments of glory in the sun, undismayed by the wipeouts that are the price of the ride. It’s being in the surf that counts, always looking forward to the perfect wave as yet unridden that gleams in the imagination of tomorrow. One day we’ll cash out our chips and ride the last wave. The sum total of your life will not be the number of chips you left, or the fame of your most spectacular ride. It will be the smile on your face as you remember your adventures, the wins and the losses, the spectacular successes and the horrible failures, knowing that you played the game of life all-in, with no excuses and no regrets.